E3 Light Polish is 100% guaranteed. Wet face and body. Place a small amount of E3 Light Polish into palm of hand. Add enough water to dampen into a light paste. Gently massage into skin. Rinse with tepid water. Repeat if desired. For optimal results, follow with E3 Light Crème or E3 Earth's Essential Cream. Mix E3 Light Polish with honey and a small amount of water. Gently massage into skin and leave on for 5-10 minutes. Rinse with tepid then cool water. For optimal results, follow with E3 Moisturizers. E3 Light Polish is a herbal dry cleanser for normal, oily and dry skin forumlated for men and women. A rejuvenating exfoliant gentle enough for everyday use. This revitalizing exfoliant gently sloughs off dead skin cells to reveal radiant, soft and supple skin. It preps the skin to receive the utmost benefit from the nutrients in our E3 moisturizers. E3 Light polish can also be used as a deep cleaning mask when mixed with honey and allowed to remain on your skin. 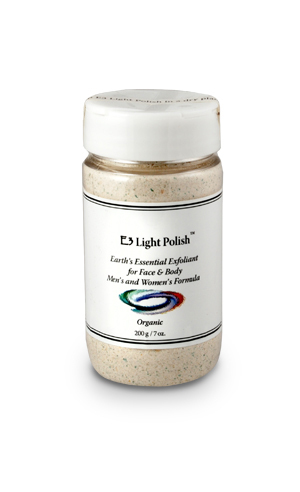 E3 Light Polish is perfect when used in concert with our E3 Light Crème or E3 Earth's Essential Cream. •Organic Ground Corn An effective natural polish. •Organic Oats A natural, mild polish soothing to skin. This oat flour comes from whole oats. We cannot guarantee, however, that it is 100% gluten free as the factory that makes the oat flour also makes flour from wheat. •Clay Very rich in trace minerals that help to soothe and clarify skin. •Algae This highly nutritious strain of edible blue-green algae, harvested from the pristine waters of Upper Klamath Lake, Oregon, contains More than 65 Vitamins, Minerals, Amino Acids & Essential Fatty Acids. •Lavender A powerful antiseptic, anti-bacterial and anti-fungal; helps to regulate the production of sebum, a natural skin oil. •Chamomile A soothing anti-inflammatory with strong healing properties. •Calendula Compounds in this flower aid in wound healing and have anti-inflammatory and anti-bacterial properties. •Rose Moisturizes, tones and promotes regeneration of skin cells, while its antiseptic and anti-inflammatory properties help soothe irritated skin. •Bergamot A mild antiseptic and astringent; very effective for healing problem skin. •Orange Helps rejuvenate dull skin. This is by far the best exfoliant I have ever tried. My skin glows all the time now! This best is mixing it with a bit of water and organic honey for a face mask. I sometimes sleep with it on and in the am my skin is so soft! I have been using E3 Light Polish for several months along with the E3 Light Creme and E3 Earths Essential Cream and my skin looks and feels amazing. 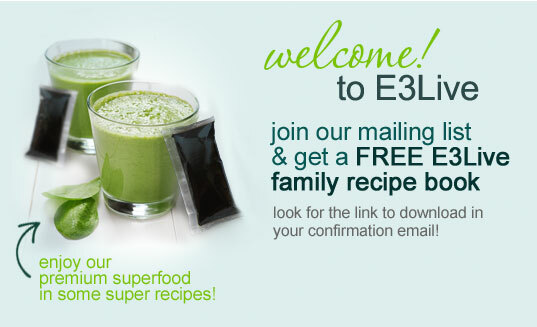 I am hooked on E3 products. They have changed both how I look and how I feel inside. I am so glad that I tried the products. This is the only product that I have found that fully cleanses my skin without break outs. It's hard to find the right consistency, and so a lot of the product can be wasted easily - and it doesn't apply evenly on the skin as opposed to other enzyme scrubs. I love how smooth and soft my skin is after using this product. It is also giving me a more even complexion. My skin hasn't looked this healthy for a long time. I found this exfoliant to be very coarse, especially the ground corn. I will continue to use until gone, but will not purchase again. I use this on my face about once a week and it leaves my skin silky smooth. I just love this product. I now wash my face with it every night. It is great for removing all my makeup and leaves my skin feeling extremely smooth.